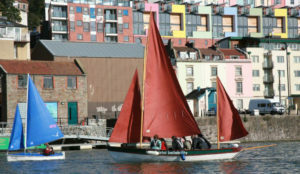 As a part of All-Aboard!, Bristol Sailability is happy to welcome groups and schools to enjoy time on the water. Depending on the needs and aims of the participants we can create a package specifically for you. To discuss requirements please email us or telephone 0117 929 0801. 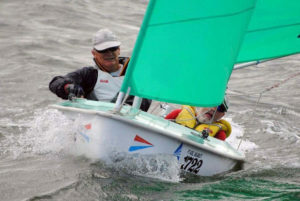 An experienced sailing instructor is in charge of your group during your sessions, he will be your first point of reference for sailing sessions. He/She may be assisted by other instructors depending upon the numbers of children/people you bring. Sailing Sessions for groups are organised in sessions of up to three hours duration (morning, afternoon and evening). You can negotiate the times you wish to arrive and leave. Below are some of the boats which we can use for sailors who need additional support. The Access 303 is the mainstay of our accessible fleet of boats. These boats which can be sailed by one or two people are extremely stable because the occupants sit low in the boat which has a heavy keel. Steering is by a joy stick (tiller) which is easily moved by hand. Accessing the boats is not a problem for those with mobility issues as we have a hoist which can lift them gently into the boat. This beautiful, traditional wooden sailing boat can take up to six people at one time to give you the experience of sailing in company. It has an outboard motor so that longer trips can be taken in the docks unsupported by the safety boat. Offers an opportunity for those with complex needs to access the water.